Glassman, Wyatt, Tuttle & Cox, PC Attorneys Ed Wallis and Kyle Cannon Receive AV-rating - Glassman, Wyatt, Tuttle, and Cox, P. C.
Glassman, Wyatt, Tuttle & Cox, PC Shareholder Ed Wallis and Attorney Kyle Cannon have achieved an AV-rating by Martindale-Hubbell. Martindale-Hubbell® Peer Review Ratings™ reflect a combination of achieving a Very High General Ethical Standards rating and a Legal Ability numerical rating. A threshold number of responses is required to achieve a rating. The General Ethical Standards rating denotes adherence to professional standards of conduct and ethics, reliability, diligence and other criteria relevant to the discharge of professional responsibilities. 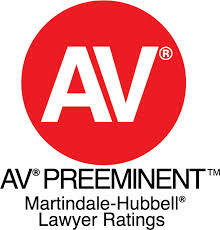 AV Preeminent® is a significant rating accomplishment – a testament to the fact that a lawyer’s peers rank him or her at the highest level of professional excellence. Mr. Wallis and Mr. Cannon are joined by other Glassman, Wyatt, Tuttle & Cox, PC attorneys who have been ranked by their peers as AV-rated attorneys, including Senior Shareholder Richard Glassman, Shareholder Dale Tuttle, Shareholder Robert Cox and Attorney Lori Keen.